The Padlock on the Outside of Our Bedroom Door. Yesterday, I had to back the screws out of the padlock on my bedroom door. I had left my keys, including the key to the padlock, inside the bedroom. It’s obviously not a very secure system if you can just open it by backing the screws out, but I’m hoping it will slow my daughter enough to where she won’t have time to steal anything before I can notice. She’s a quick, adept thief, and she lies like a politician. It’s difficult for me to remember to lock the door, hide my purse even when it’s inside my bedroom, and keep the keys. My daughter is a heroin addict . When she was living here with her boyfriend and daughter, she stole a heavy gold necklace from my grandmother. My grandmother died about 15 years ago. I had just bought an antique cameo pendant so I could wear the necklace. Now, I have the cameo but no necklace to wear it on, since I don’t have any other gold necklaces. She, also, stole my grandmother’s heavy gold charm bracelet that chronicled her travels. This was probably worth $2000 with today’s gold prices, and it had incredible sentimental value. She knew that, but the bracelet is now a melted down chunk of gold somewhere anyway. What actually prompted me to kick her out of the house, though, was the theft of credit cards and debit cards. I don’t know how long she had been stealing them before we first caught her. She would steal our cards out of my purse and my husband’s wallet and then return them unseen. My husband and I began having money shortages and blaming each other for excessive spending. We printed out our bank statement and went through the expenditures, each blaming the other for purchases at Walmart, Kroger, and gas stations. When neither of us had made those purchases, we realized that it was either her or her boyfriend. This is when we confronted her the first time about stealing. She denied having made those purchases, and we told her we would contact the credit card company. The companies would prosecute whomever they caught. She confessed, but we still didn’t understand the extent of the problem. Our daughter was twenty when she gave birth to our granddaughter. She had no job and had just begun her first semester at a local college when she realized she was pregnant. She dropped out of school, thus wasting the tuition we had spent only weeks prior. Her boyfriend had a job as a mechanic. We allowed them to move into our basement, which is fully finished with its own half bath and thermostat. She was and is still on our insurance. She gave birth to our granddaughter while laughing at a standup comedy routine on the television in the hospital room. It was a ridiculously easy labor and delivery that I was privileged to witness. I cut baby Faith’s umbilical cord. We knew our daughter had more than experimented with drugs, including meth, before her pregnancy, but I don’t believe she used anything while she was pregnant, and Faith is a smart, healthy child. The thefts began when Faith was a little over a year old. Our daughter’s boyfriend had held and lost probably 6 jobs over the time they lived with us, and he spent most of the time unemployed. They had food stamps, which they frequently forgot to renew, but they had no other money to speak of. Her boyfriend had been a heroin user and was on methadone for years. At one point while they were staying with us, he went into a drug treatment program in Florida. Our daughter was taking online courses at an accredited online college . We had told her that if she graduated and got a job, we would pay off her student loans. At first, we believed she was stealing to put gas in her car and to get food when she didn’t have her stamps, even though we made sure to keep enough food that they could feed themselves and our granddaughter. We reset our pin numbers, and I got a new photo for my debit card . I wrote in sharpie over my other cards, “Please verify exact ID”. It didn’t make any real difference. I was appalled at how many stores still didn’t require that I give them ID, and our daughter was still able to make purchases. At one point, the fraud department at one of the card companies called me. The charges they were concerned about were valid, but in the course of that conversation, I learned that four tanks of gas had been purchased within two days. We only have two cars, and I hadn’t purchased any gas. She was buying gas for other people on our cards, since she only had to enter our zip code at the pumps. We told her that we were having financial difficulties due to her thefts. It didn’t make any difference. At one point, she stole more money than I made in a month. 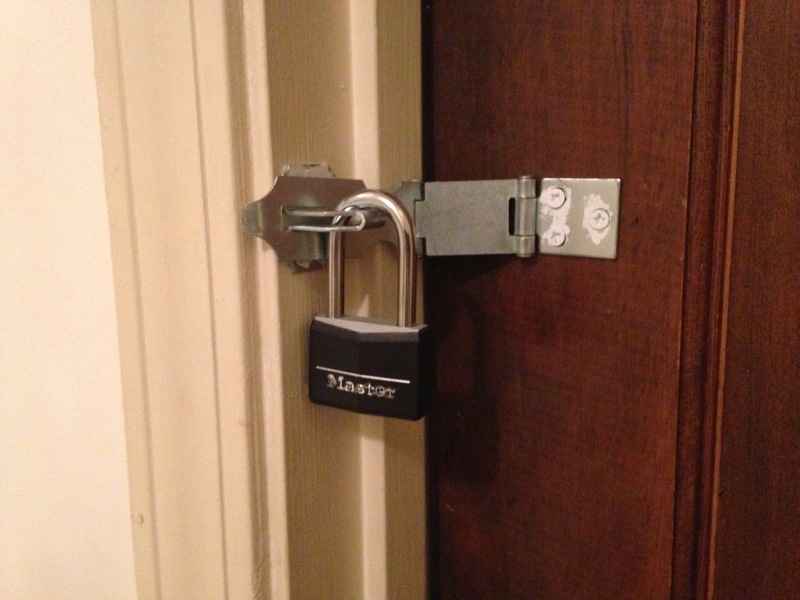 We installed the padlock on our bedroom door, but were both still not as careful as we needed to be about leaving our purses or wallets unattended. The final straw came when I went hiking by myself. I had been letting her know where I was hiking as a safety precaution in case I failed to return. The trail that I had been hiking was an urban trail which crossed several streets. When I was almost back to my car, I watched my daughter’s car drive past the trail. I called her and asked, “Did I just see your car out here?” She said no, she was at home 45 minutes away, but that she had been told there was another car that looked like hers in the area. The car I saw looked EXACTLY like hers, right down to the Baby in the Back sign in the window. I reached the car and immediately checked my purse. Two credit cards were missing. I called her and told her she had 15 minutes to get back to the car to return the cards. When she, her boyfriend, and their baby in the car seat got there and returned the cards(minus a gift card and the cost of a full tank of gas), I told her she and her boyfriend had two weeks to find a place to live, but she would need to leave Faith with my husband and me.Two weeks later, they left, even though they had no place to go. I took a leave of absence from my job to care for Faith. A friend told me that our daughter had offered to “stick” her daughter. That’s when we knew she was using heroin. She is a rock. She is an island. Today, I asked my mother in what I hoped was a sensitive, caring manner whether she had considered that she might have had a stroke at one point. It’s not that she limps or that the left side of her face won’t work right, and it’s not that she’s reporting any symptom that’s alarming. It’s that she simply won’t monitor what comes out of her mouth. She says some really nasty things and then refuses to admit that they were nasty or that she has any need to apologize. Every time I go through this with her, I tell myself, “Set boundaries. Limit your exposure. Talking to her never helps. It only makes her defensive and angry. She won’t change.” And yet, I keep forgetting and keep trying to ease her into becoming a person that I would enjoy spending time with on a consistent basis. She often is a person I enjoy spending time with- if she doesn’t have anyone to talk about in a negative way behind their backs and until she blindsides me with another nasty comment. My younger brother has decided to deal with this by just not answering her phone calls or spending any time with her, even though he only lives ten minutes away. He hasn’t seen or spoken with her for 6 months and says he won’t until she apologizes for something she said to him. He calls her a “nasty piece of work”. My older brother doesn’t believe our mother’s verbal dysdecorum is deliberate and is more hurt by the fact that she never remembers his kids’ birthdays. When people ask me about her, I usually tell them that she is like an inhabitant of a rocky, barren island. She’s self-sufficient, capable, and not entirely friendly. I don’t remember her always being like this, but people tell me she was. When my best friend’s mother was diagnosed with ovarian cancer, my friend says that my mother told her mother something to the effect of, “You know that is one of the most painful and awful diseases with a really low survival rate”. Even if that is true, someone who’s newly diagnosed isn’t going to want to hear it. That would have been before my mother’s heart attack about twelve years ago. I began noticing the poisonous comments after her heart attack, which made me concerned about a possible stroke. You’re probably wondering what she said to me that led me to suggest in my thoughtful, diplomatic way to her that she might have suffered brain damage. We were discussing my daughter, who is currently homeless. My mother said my daughter should stop trying to get by in life “on her back”. Now, my daughter is a heroin addict , which is why she is currently homeless. To my knowledge, she is not a prostitute, and the guy she is currently dating is living in a male sober living facility and doesn’t have a penny to his name, so I doubt she is getting anything from him by being on her back. In my conversation today expressing my concern for her and desire to spend more time with her, I suggested that if you were to poll 100 people and asked them if it was a good idea to tell a woman that her female child was getting by in life “on her back”, you could probably expect at least 98 to say no. What do I have to say that’s worth taking anyone’s valuable time? Probably nothing worth valuable time, but something worth my time. If some one else finds what I have to say to be helpful or interesting, then it’s just a bonus. I’ll give a little synopsis of my current life. I am 49 and just filed for divorce from my husband of 23 years in part because he decided to join a swingers’ group. I have two children, one of whom is on the dean’s list at college every quarter and one of whom is a homeless heroin addict. We had a third child, but he contracted E Coli meningitis when he was three weeks old and was multiply handicapped and medically fragile. He died seven and a half years ago when he was almost twelve. My husband and I have legal custody of our granddaughter, and she will be living with me when we move following the divorce.